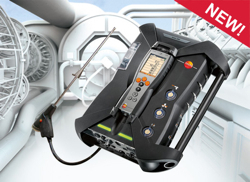 The all new Testo Model 350 is the most innovative portable combustion analyzer to date. 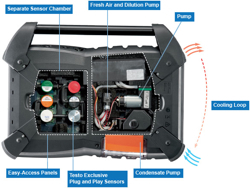 Keystone features of the Testo 350 include interchangeable, pre-calibrated sensors with temperature control; a CO sample dilution system for test range expansion; complete, onboard sample conditioning; and an abundance of opportunities to interface with the entire system. The cells of the Testo 350 can be easily replaced or exchanged for greater testing flexibility. This item is available for rent from CleanAir Rentals.